I invented Veretekk that introduced Automated Marketing to the Internet. You remember the Traffic Portals (capture pages), The Bully Pulpit email autoresponder and broadcaster, the Hammer massive link submission, Leadsomatic (turned traffic into leads and leads into customers), the Platinum Control Panel (lead nurturing, roi, back link management, etc. ), the affiliate program that made massive income for those that converted into promoters of the system, all of this exactly what Inbound Marketing has been defined as being by the current contemporary collection of tool providers. We did not know it then, but we certainly know it now. Today Inbound Marketing (Automated Marketing) tool companies are springing up and thriving with huge monthly fees as much as $6000 per month (and require payment in full for a full year @ $72,000). Companies like Pardot, Hubspot, Marketo, Eloqua, etc. One of them claiming to have invented “Inbound Marketing” in 2006, whereas back in 1998 we were inventing Traffic Portals to attract clients, the Bully Pulpit to nurture the leads, upgrades like found in Leadsomatic and Veretekk, to turn the leads into customers and the affiliate programs turning customers into promoters is the very definition of Inbound Marketing. Most of you were subscribers to Veretekk back in the 90s and early 2000s. Remember Blastomatic, Money-Machine, Leadsomatic, etc.? They were called Traffic Portals and used to attract potential customers and process them through the funnels until they became your friends in your Veretekk sphere of influence. We delighted people back then with Veretekk. You should know, you were there. We are just now opening up Markethive after nearly 4 years of development and about $500,000 of invested capital. Markethive will have a significant affiliate program too. Paying out as much as 50% on all the advertising revenue. Until we do launch we are offering a very limited partnership offer to the next 80 people and then it is ended and soon the entire operation goes live. I want to make sure you understand what the potential for Markethive is and that you do not miss this opportunity to be among the very few who will be the biggest winners in the coming affiliate program. Other similar Inbound Marketing platforms (that do not have the social network aspect) sell for as little as $200 per month, with very limited resources and small lead databases as high as $6000 per month, but require a full years payment upfront ($72,000). Markethive has no limits (or cost) on your leads or your groups or your team members and Markethive is the most advanced Inbound Marketing system and the only Inbound Marketing system integrated into a fully dynamic social network and the only Inbound Marketing system that is 100% free and funded by advertising and is the only potential big data system around that has these. Some explain Markethive as being similar to; Facebook in navigation, LinkedIn’s Profile, Hubspot’s Inbound Marketing and Paypal’s affiliate program (remember when). It is safe to say Veretekk was the first Social Network, we just didn't know it, Veretekk was the first Inbound Marketing, we just didn't know it. We were the first self-replicating web system too, we just didn't know it. 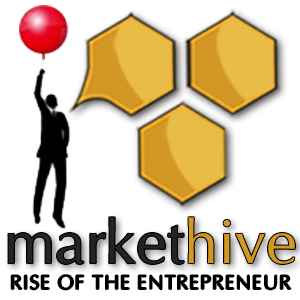 Now Markethive launches as the first Inbound Marketing Social Network. Vertically marketed just for you if you are an entrepreneur. If we achieve just 10% of what LinkedIn has recently achieved, your return on your Alpha Legacy cost will be, rather prodigious‎. In other words, buying an Alpha Legacy, is a no brainer, buying more than one is smart. So the next time you log into Markethive, go to your Alpha Promotion link found on your Home Page under your picture under MAIN MENU. See picture below . Join the Rise of the Entrepreneurs with us!